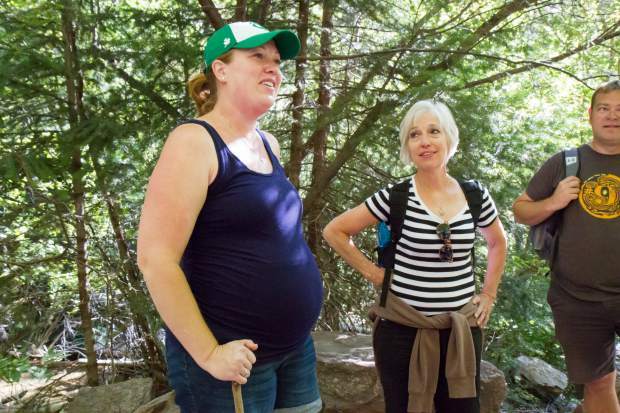 Jennifer Mathesed and Kathleen Hanson hike up to Hanging Lake with 23 family members on Tuesday morning. Crowds can reach more than 1,100 visitors on summer days, which leads to overcrowding on the trail, damage to the sensitive travertine lake ecosystem, and illegal overflow parking at the trailhead and rest area parking lot. Hanging Lake is a popular tourist destination located in Glenwood Canyon, about 7 miles east of Glenwood Springs. 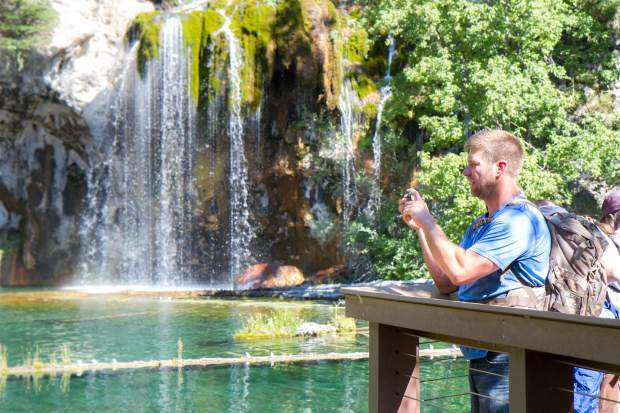 Alan Brekke from Minnesota takes a photo Tuesday morning of the cyrstal clear water at Hanging Lake. 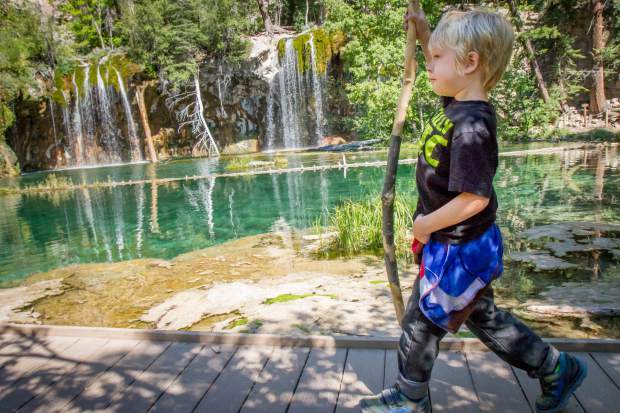 Five-year-old Ethan Patterson walks along the boardwalk after making the trek up to Hanging Lake on Tuesday morning. 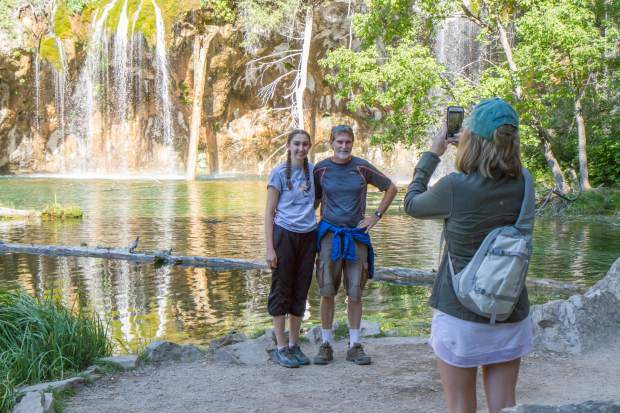 Paul and Anna Johnston from Wisconsin get their photo taken in front of Hanging Lake on Tuesday morning. Many hikers on Hanging Lake Trail on Tuesday morning welcomed the White River National Forest’s proposed access restrictions. Several were disheartened by trash and graffiti they found along the way, which, along with overloaded parking at the trailhead, is part of the reason the U.S. Forest Service is proposing a fee and limited access to the popular attraction. White River released a proposed management plan Tuesday that would include some significant changes, including capping the number of hikers at 615 per day, and requiring hikers to pay a fee and take a shuttle during peak season to the trailhead. 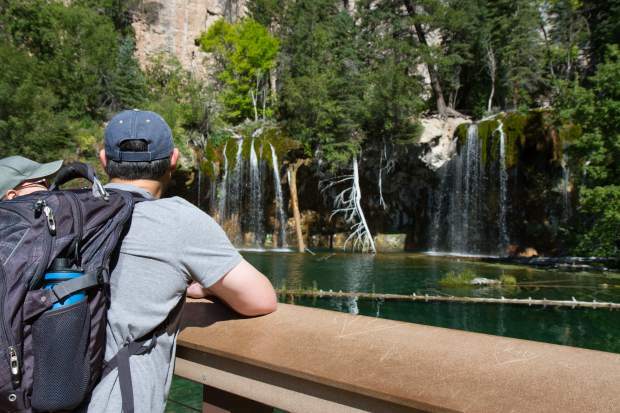 The Forest Service is proposing these measures after watching Hanging Lake endure for years the problems that accompany loads of people who don’t know how to leave no trace. This has included graffiti as small as penned initials to as obvious as spray paint, hikers ignoring the no-dogs rule, visitors diving into the fragile ecosystem of the lake itself and blazing past signs marking fragile areas. Lots of questions are still up in the air, but many hikers said they didn’t have a problem with these steps if they help reduce the impact on the lake and trail. Hikers were pretty sparse early Tuesday, with only a handful of cars in the parking lot. But the tire and foot traffic picked up in just a couple of hours. Minnesotan Kathleen Hanson, who was hiking along with 23 family members, thought that most people visiting the landmark would be understanding and wouldn’t be scared off by the new restrictions if they go forward. Hanson said she supports adding a fee if the money goes toward maintaining the trail and lake. “As long as it’s not too much, people will be willing to kick it in,” she said. The Maroon Bells trails already have a similar shuttle system, added Peter Craik, who’s also from Australia but who lives in Denver now. Peter thought it would be fine if the Forest Service transitions Hanging Lake to a system like at Maroon Bells. “The Forest Service’s steps sound reasonable, and it’s not like we’re going to come here every week,” he said. The last time Paul Johnston of Wisconsin was at Hanging Lake was 20 years ago. On Tuesday he brought his daughter Anna Johnston to see the trail, lake and falls. Paul noticed a few more restrictions than he recalled seeing before — more chained-off sections and signs barring access to fragile areas. One of the big questions is how long in advance hikers will have to reserve a spot to get on the trail. Still, a bus system could help regulate how many hikers would be on the trail at a given time, he said. “Hanging Lake is just beautiful. 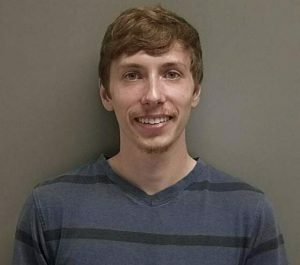 From our standpoint, being able to use it is really important,” he said. Martha Johnson of Conifer first hiked Hanging Lake 20 years ago, and Tuesday was her third time on the iconic trail. She was joined by Antje Sliger, who lives in Lafayette but who is originally from Germany. 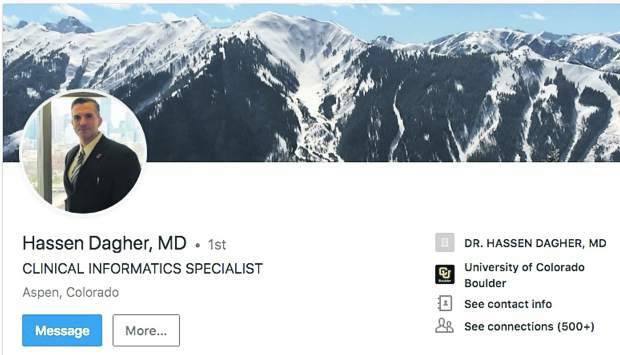 The two former Denver Public School teachers said they spotted a water bottle, a can and some tissue papers on their way up the trail. “And the beastly graffiti at the shelter and on the trees is heartbreaking,” Johnson said. Both said they were all for the proposed restrictions. “We have to protect this area for future generations,” Sliger said. Other locations such as Rocky Mountain National Park are already operating under similar shuttle systems, said Johnson. Johnson said they would “absolutely still hike Hanging Lake if a fee and shuttle system were implemented. “I know we need to share these space, but with the influx of so many people to Colorado — if we don’t preserve this place no one will. This is an irreplaceable treasure, and it’s our God-given responsibility to protect it,” said Johnson. Kyle Menting and his wife, from California, were visiting for the first time Tuesday morning. 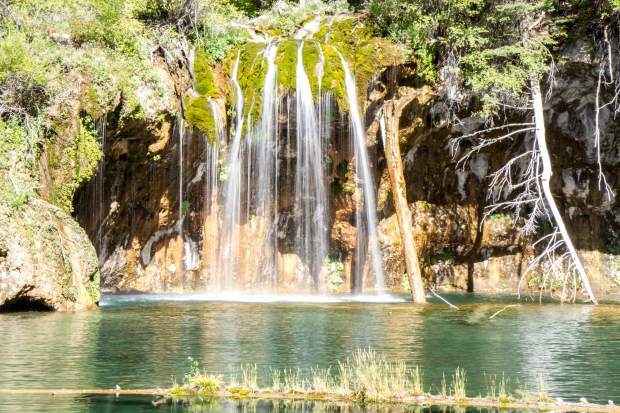 Menting said that, as an avid hiker, he would definitely still come to Hanging Lake despite new access restrictions. Menting, too, said he noticed some trash along the trail Tuesday morning. The people who truly care about places like this will keep coming even if there’s a shuttle and fee, he said. 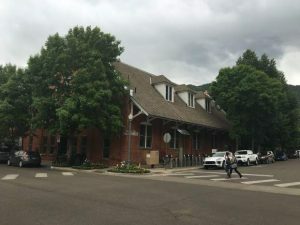 The people who would be turned off are probably coming to Hanging Lake because of its convenience, and they’re probably the ones more likely to leave trash behind, said Menting. The shuttle system might even make the trip easier during the peak visitor season, since hikers won’t have to deal with the parking lot filling up early and having to shuffle around the interstate waiting for a spot to open, he added. Plenty of hikes in California already require an online reservation, he said. But it’s still not clear how the Hanging Lake permit system would work and how long in advance a hiker would have to reserve the permit to make their hike happen. “I don’t have a problem with added restrictions if it helps preserve parks and forests,” he said.